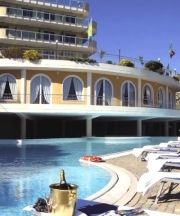 The hotel is located only a few minutes from the centre of Sanremo, a city known the world over for the many events that it hosts, including the famous Festival for Italian songs, the Tenco Prize, the Rally and in sporting circles. La Rosa dei Venti hotel is ideal for a new type of holiday, namely the growth of tourism where nothing is left to chance. The facility can change at will, taking on different forms and colours depending on the type of stay requested. La Rosa dei Venti hotel residence offers clients various types of stay that allow them to design one that is perfectly suited to them. making the hotel the central attraction of their stay in Sanremo. The elegant suites, which have a large balcony with a sea view, allow you the luxury of a refined holiday and to live like real VIPs. They have air conditioning, telephone with a direct line, colour TV, minibar, hairdryer and safe. The suites offer an ideal setting to grant you the privilege of a sought after and elegant environment. The superior rooms are different for their simplicity. For their modern and functional style, which is sober and essential at the same time. They have air conditioning, telephone with a direct line, colour TV, minibar, hairdryer and safe. If you have a family, there is a small room for the little ones and the possibility to heat up milk and baby food in the room itself. Cots are available for babies. For those who do not like to “accustom themselves” to drastic changes, but expect to experience their holiday in full freedom…keeping up their day to day routine... The residence formula becomes the objective. The target to hit.Small two or one-room apartments will transform into your refuge for your weekly stays with free arrival and possibilities to split the prospective stay as from the start of the second week. The apartments are equipped with air condition, colour TV, direct line telephone, balcony, safe, hairdryer, cooking corner, fridge, bath and bed linen, and use of tableware and plates. A mid-weekly change of bath and bed linen is included in the package. The “Al Bergamotto” restaurant is the complex’s highlight an elegant and sophisticated meeting point, in which the imaginative Chef conjures up refined meat and fish based dishes. The elegant surroundings, where white and the natural light stand out against the backdrop of a wonderful view with the green of the palms and the blue of the sea, become centre stage every time by turning themselves into the ideal location for a “tailor-made” event. The Caribbean swimming pool, the terrace with a sea view of Sanremo and the modern bar in the lobby, become peripheral areas where you can organise smaller events like aperitifs, cocktail parties and quick brunches. This is our Home, where the essentials are Hospitality and Friendliness. 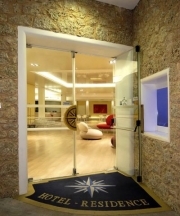 Where attentive and kind staff are glad to see to your every wish. The hotel also has a free shuttle service for individual outings at prearranged times to the beach, the Casino, the Ariston theatre, the Palafiori flower market. And a few kilometres from the Riviera dei Fiori, the possibility of diving into the beautiful water of the Côte d’Azur at famous places such as Monaco in Monte Carlo, Cannes, Nice and Menton if you want to treat yourself to a proper VIP day out. You can easily reach us from the Sanremo West exit of the Autostrada dei Fiori, “La Rosa dei Venti” Hotel Residence is in the most attractive part of the city that commands the best views.